Join your Temple Beth Shalom friends at Mobile Loaves & Fishes on the first and third Fridays at 11:00 am to cut and bag donated pastries for delivery to the homeless and working poor. We do Make Ready (meal preparation) the 3rd Sunday of each month at 3:00 pm and take the trucks out to serve the meals at around 4:00 pm. For more information, contact Bob Batlan at (512) 263-4177. Temple Beth Shalom raised $20,000 to fund one micro-home for the Mobile Loaves & Fishes Community First! Village. Brotherhood then led the efforts to build it! The Community First! Village provides affordable housing to disabled and chronically homeless individuals in a supportive East Austin community. 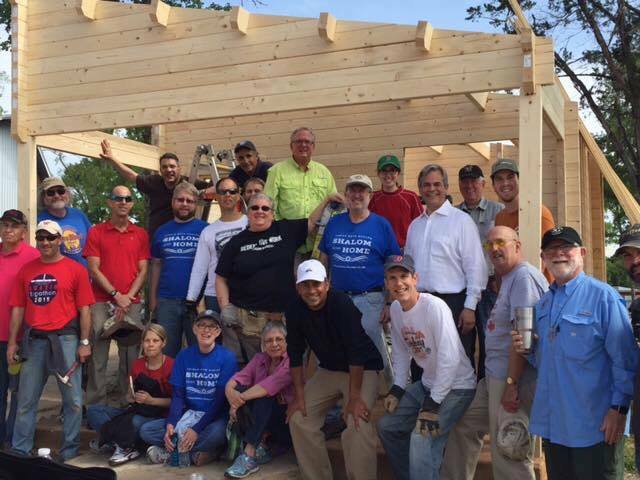 Volunteers constructed the micro-home, which was completed in one day, on Wednesday, April 6th, 2016.